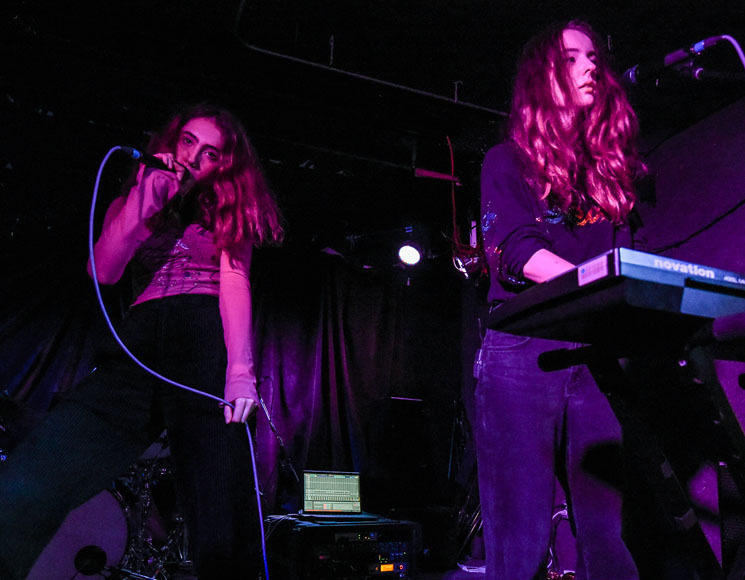 Originally scheduled for the Drake Underground, Let's Eat Grandma's Toronto debut was upgraded to the Garrison due to some flooding damage. The venue change meant an ever-so-slightly roomier space and some extra tickets, which were in high demand since the show originally sold out. The Norwich duo of BFFs Jenny Hollingworth and Rosa Walton, who first met at the age of four, walked out in their bellbottoms to their live drummer keeping the beat to "Whitewater," the opening track from Let's Eat Grandma's latest album, the excellent I'm All Ears. Once they got settled in, they jumped on their keyboards and shared vocals for their SOPHIE/Faris Badwan-produced single "Hot Pink," which doubled as the colour of Walton's long sleeve top. It was the beginning of a night that would see them demonstrate their unique approach to vocals: harmonizing, tag-teaming, and even singing overtop one another. At first, it felt like they would run through the entire album, playing its first four tracks in a row. During "It's Not Just Me" they came out from behind their posts to dance around and share lead vocals; "Falling Into Me" built itself into an ecstatic groove that reached climax once Hollingworth grabbed her saxophone for its coda; and Walton used her Mustang to lead "I Will Be Waiting" into grungier terrain. On the nine-minute "Cool and Collected," they took their instrumental prowess even further, using pedals, guitar and piano to float into the extended space rock jam. Hollingworth followed Walton's minimal piano accompaniment to give the night's best vocal take, infusing "Ava" with some raw emotion. And then they went down and laid on the floor as the epic "Donnie Darko" began. When they stood up, they got the undulating synths going and broke out the rhythm by playing patty cake. That was only the beginning. Keyboard swapping occurred, dancing ensued, and Hollingworth jumped into the crowd to bounce around. Then they played dead again, before Hollingworth brought out her recorder, which earned a loud cheer. Much like a lot of their gestures, they also said thank you in unison, then left the stage, and re-emerged within seconds. For the encore, they played the only song from their 2016 debut, I, Gemini, playing some more patty cake for the beginning of "Deep Six Textbook." With the dirge-y organ leading the way, it was a sombre note to end on, but their layered vocals sounded spectacular, not to mention Hollingworth's honking sax solo. With such a humble setup, Let's Eat Grandma could have easily stood up there for the 45 minutes and hid behind their instruments, like so many bands tend to do. But Hollingworth and Walton are natural entertainers who know not only how to choreograph a show fans will, ahem, eat up, but also exhibit their wide range of musical chops. I can only imagine when the day comes where they will have the elaborate set designs, eye-popping visuals and furry dancing creatures on stage with them to fully encapsulate the whimsy and captivation of their wonderfully weird music.